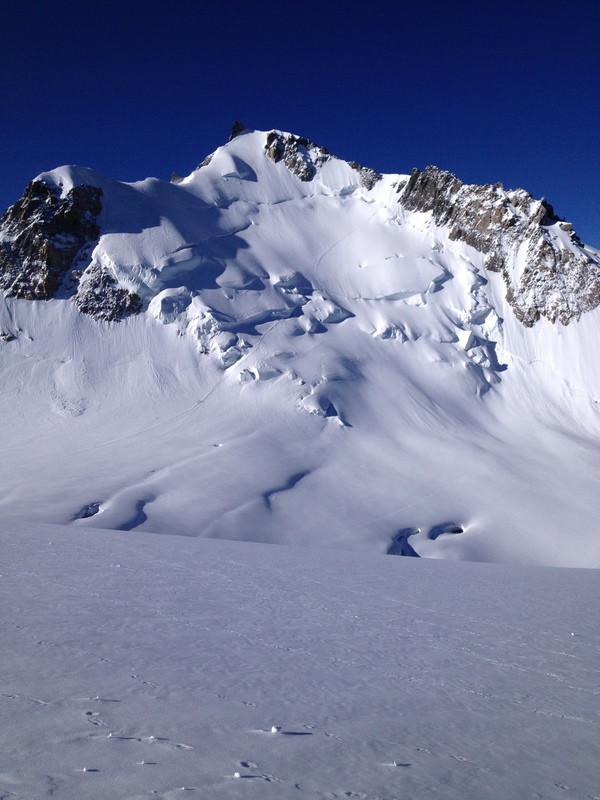 After doing nothing last week apart from drinking and partying I had to do something to redeem myself, I thought that Mont Blanc could be a tough challenge for a monday morning! 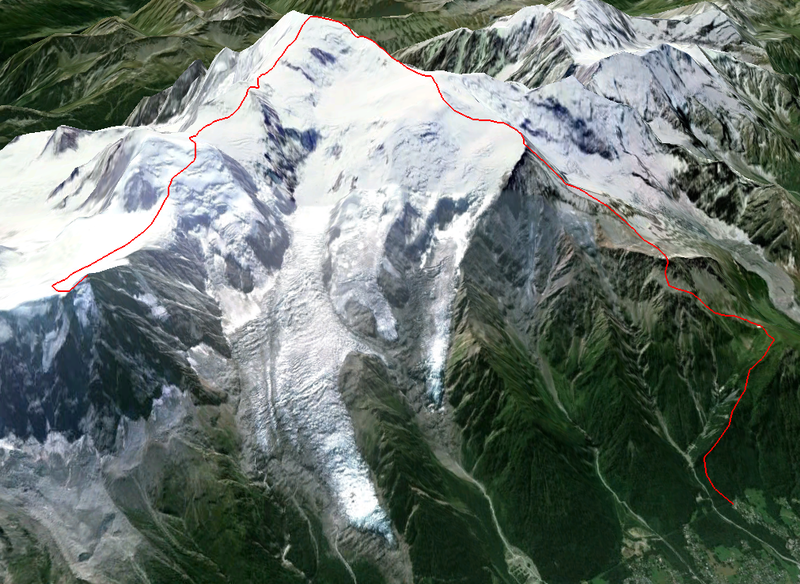 The route is around 20km long with 1400/1600m ascent and 4000m descent. The last time I was up high was two weeks ago when I did the Entreves traverse and this was only 3500m, so with no acclimatising I headed up the Midi first bin with Emily who only discovered that I was going to do it the night before at about 9pm, she is off on expedition soon and needs the high altitude training, and with over 7 hours above 4000m this was perfect. I wanted to do it solo originally so that I could go as light as possible, Emily had the same idea, and as we did it together we had no ropes or crevasse gear just a harness, sling and ice screw. The only thing we did bring that most others wouldn’t is trainers. 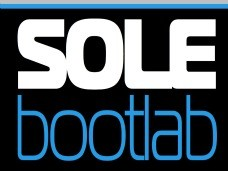 After suffering last year on the descent from the Gouter refuge I knew that I would love to put on some new socks and comfy trail running shoes for the scramble and the miles and miles of trails back to Les Houches. Leaving the midi station at 7 we were quick down the arete and straight onto the Tacul, the crevasse in the middle of the face is now a bit of a overhang climb for a couple of moves, once over this obstacle we were at the shoulder before 9am, 2 hours in and looking good. 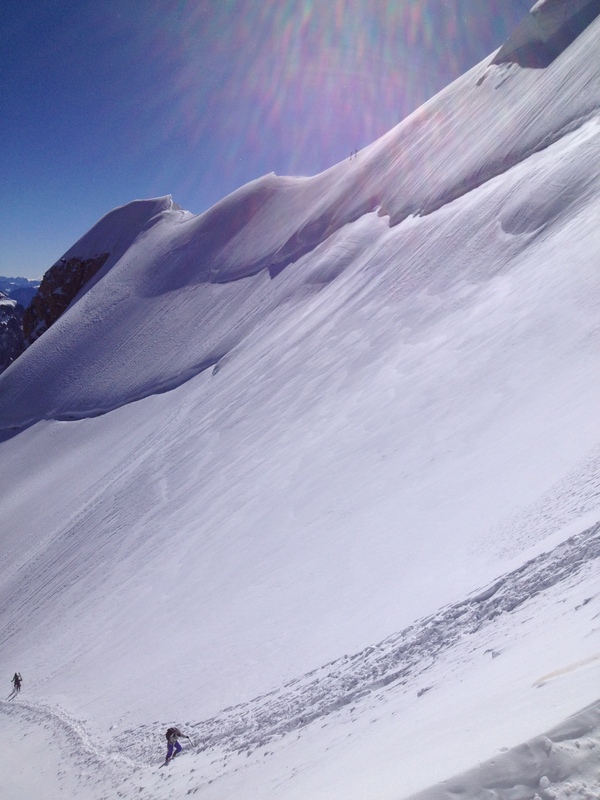 Once over the shoulder it is on to Mont Maudit, this is a little more technical than the Tacul as there is a section of about 30/50m 45′ snow slope to climb. 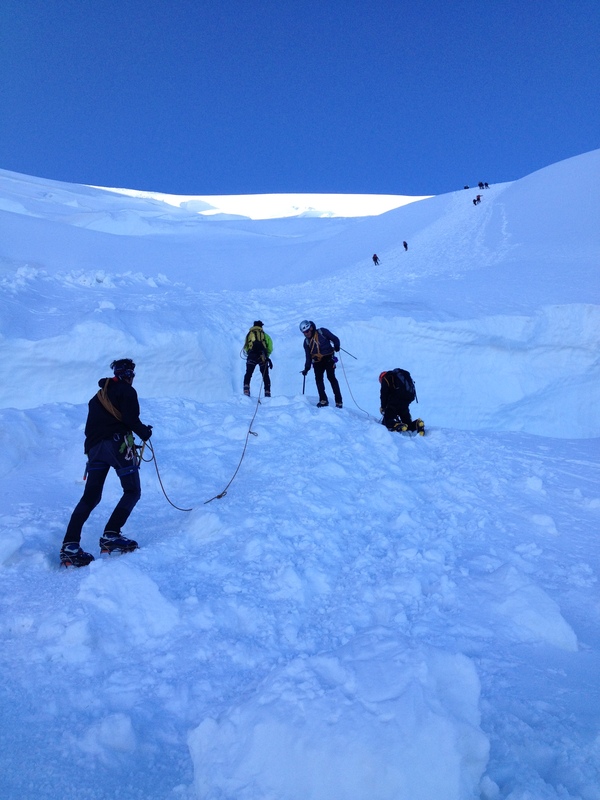 We started the steep climb as many teams were on their way back down so it was a bit of a mess with ropes and people everywhere. The climbing itself was not too bad, you had to rely on your front points at times as it was icy. We were over the shoulder of Mont Maudit just after 11 and we were both feeling good. I didn’t fancy down climbing the slope we had just come up so pushing on and completing the traverse was the only option! After the Mudit we could see the summit and this is when the wind really started to pick up and it was howling. 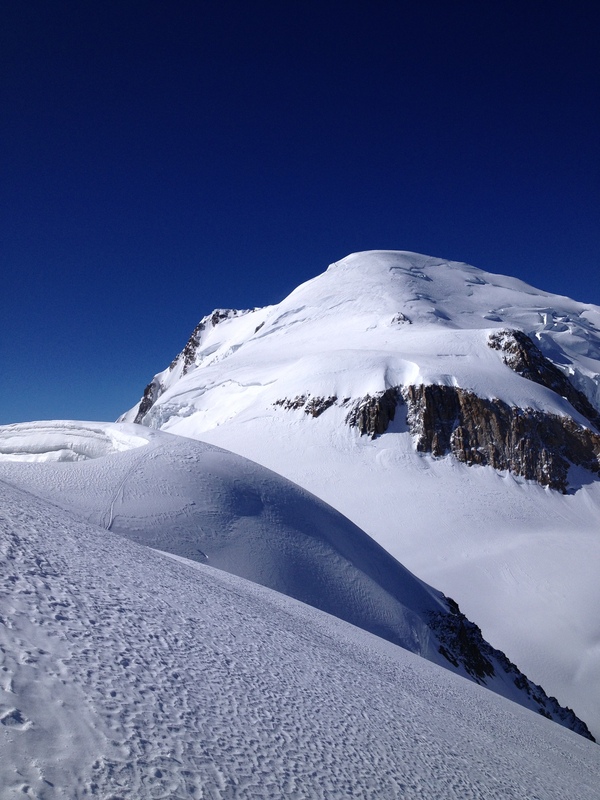 The temperature on the Tacul and Maudit was pleasant, and then on the summit slopes we were freezing, hands and face were burning with the cold winds. 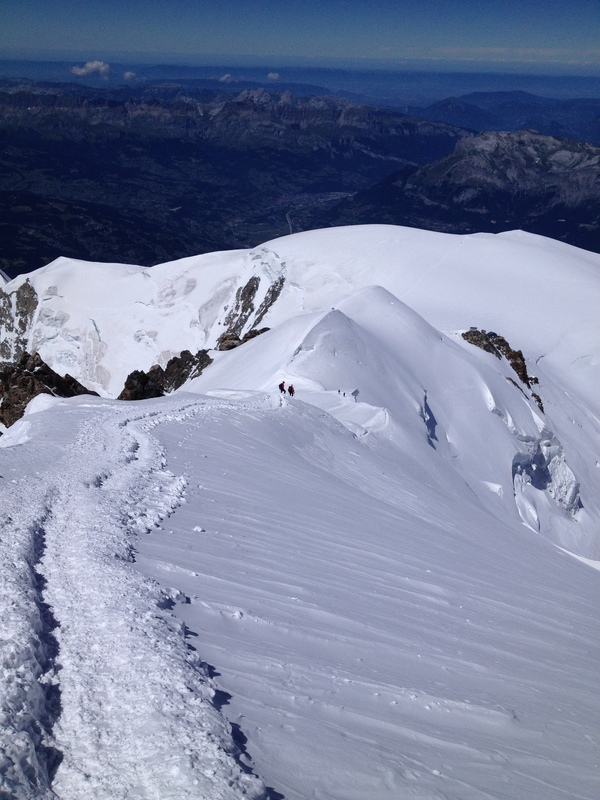 We slowly plodded up the summit slopes and got to the summit at 1pm, 6 hours after setting off from the midi. We were both pleased with this time as we had not been up high for a couple of weeks and the wind did slow us down slightly. 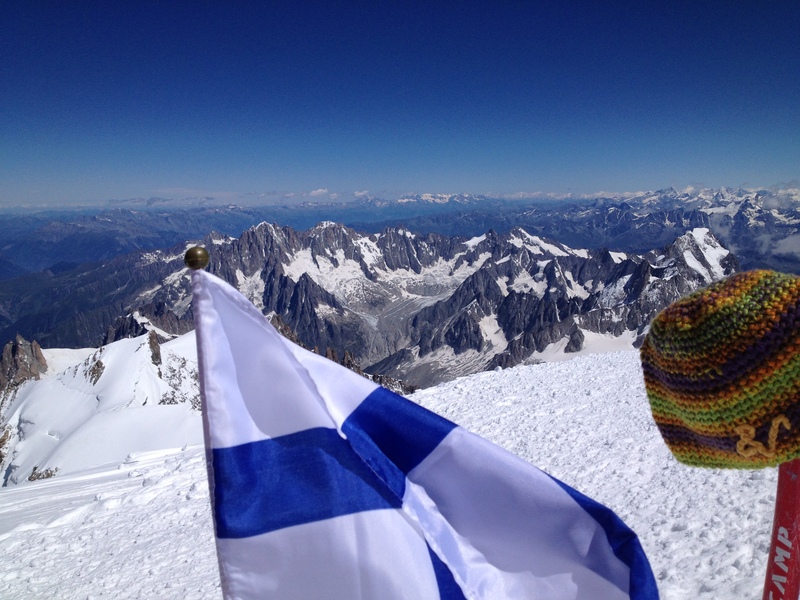 A quick stop on the summit, I took a Finnish Flag up for my Girlfriend Katariina as she didn’t manage to make it up Mont Blanc this summer, then we started the descent. Not a lot of good photos from the top as it was so windy I didn’t want to take my gloves off for very long! 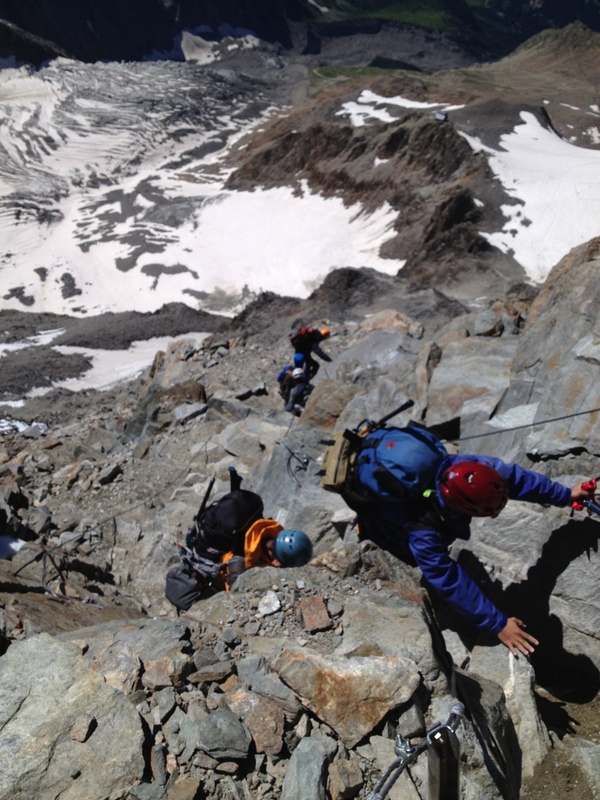 We descended the ordinary Gouter route towards the Vallot hut, where we stopped for some food and water and shelter form the wind. 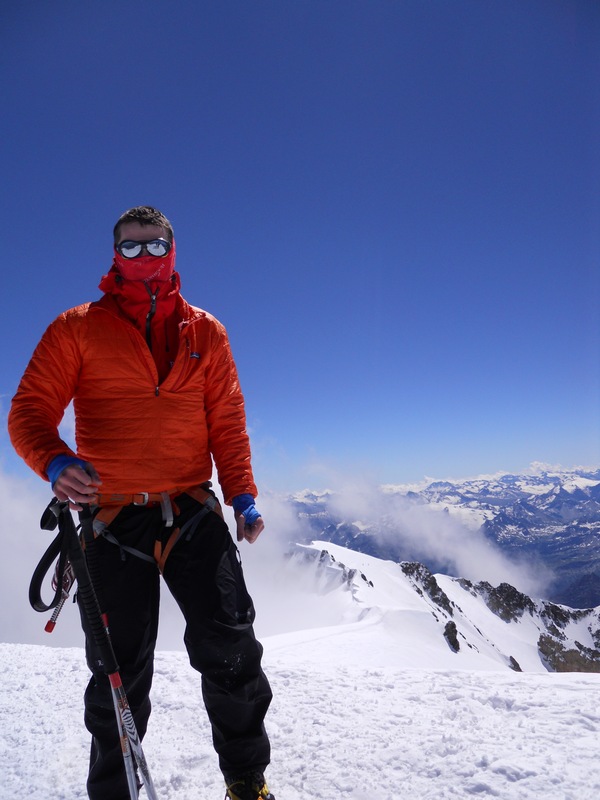 After this short stop we made a quick descent to the old Gouter refuge where we changed into our trainers and shorts, this was so nice to do as it made the rest of the climb back to Les Houches comfortable and more enjoyable than if we had done it in big boots. 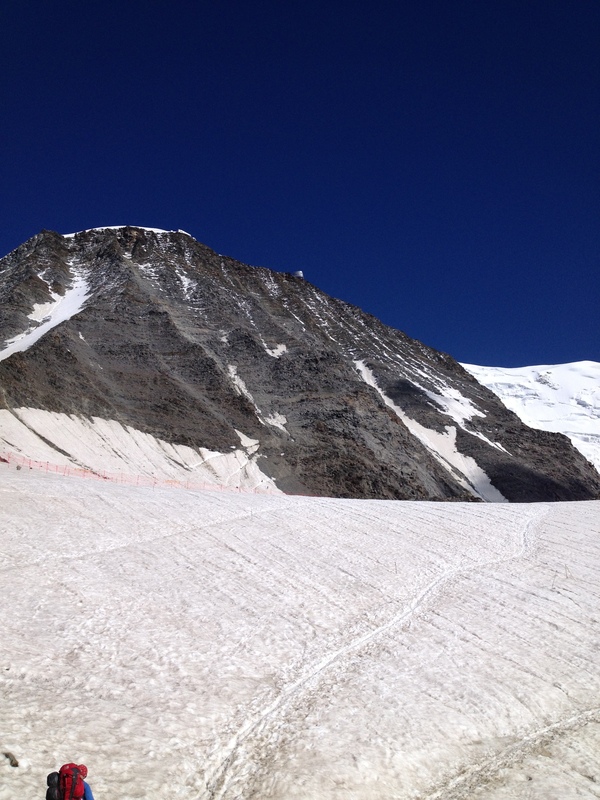 The start of the Gouter scramble. Looking back up towards the Gouter face, Still a long way down from here! 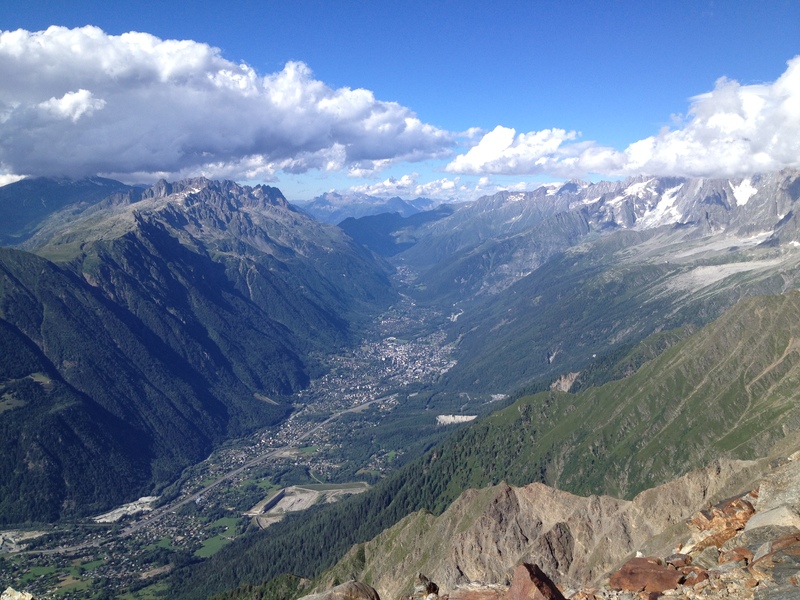 Great views of the Chamonix valley on the way down. The walk down to Les Houches took 7:45 from the summit and its 3800m descent, we were ringing all our friends for a lift back from Les Houches, we didn’t have much luck at first, Thanks Ally Hurst, but then Emilys friend Bella came to our rescue and picked us up from near the town centre and took us both home, the real hero of the day!! I am writing this with a very sore and stiff ankle and the tightest quads I have ever had, a good sign that Yesterdays traverse was a beasting! Glad to have been back on top of Mont Blanc and this time in daylight, It was Emilys first time up there so smiles all round. I think I am over it now, maybe once more up there in the spring, but with Skis! !